I have a few quick things to tell you. 1) It is 70 degrees and sunny outside. Finally. 2) Tomorrow I am piling my car with ingredients to make six large pizzas and my 7th version of the salted caramel chocolate cake that I won’t stop yammering on about or linking to. I am taking a ferry to an idyllic spot for a night with 18 women. Without my husband or children. 3) I have an appointment scheduled to get my tattoo next weekend. I think I am going to wimp out a little bit and get it on my right wrist instead of left forearm – a little smaller. 4) I have a new post up at Amazon Fresh (you will need to scroll down a bit). I wrote about (eek!) salmon. But the marinade I made works really well with tofu and I also share my favorite way to prepare bok choy. 5) I found my favorite potato salad. I tend to be of the olive oil-dressed camp rather than the mayo-dressed, but this creamy dressing is better than either. It’s the tarragon, I’m telling you. The original recipe called for fingerling potatoes but I used a mixture of red and purple potatoes. Much prettier that way. Cover potatoes with cold water by 2 inches in a medium saucepan. Bring to a boil; add 3 tbsp. salt. Reduce heat to medium-high; simmer the potatoes until tender, about 8 minutes. Transfer to paper towels to drain. Bring another medium saucepan of water to a boil; add 2 tbsp. salt. Blanch the snap peas until just tender, 1 to 2 minutes. Let cool in an ice water bath. Drain and pat dry. 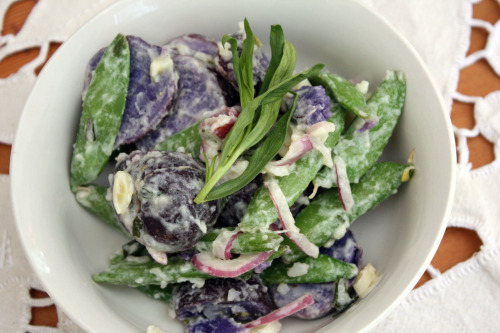 Toss the potatoes, snap peas, onion, and vinaigrette in a bowl. Season with salt and pepper. Stir together vinegar and mustard; season with salt and pepper. Pour in olive oil in a slow, steady stream, whisking until emulsified. Stir in sour cream and tarragon. This looks like my kind of potato salad. Thanks for sharing. Have a fabulous weekend, sounds like a fun one! I’m so jealous of your weekend!! And the cake (which I was too terrified to make). But the salad, I can do. Looks lovely and I do love the addition of snow peas. Sounds like you are off to a fabulous weekend of total relaxation! I love tarragon too! Just wish I could grow it; grandma used to stuff it in chicken and I never thought of it in connection with potatoes. Great idea! I’m not really a mayo potato salad person either, it kind of creeps me out to be honest, but this looks so good! Have a great weekend, it’s suppose to stay nice! I’m with Tracy. If I could be there, eating your pizza and some salted caramel cake of heaven. And be chilling with you. (The cherry on the sundae :P). I would be seriously content. Ironically, I just posted a tofu recipe with bok choy! Will have to check yours out. I hate mayo-based dressings. But this sour cream/olive oil mixture, I could totally get behind. I love that you used purple potatoes. So pretty! i love tarragon in salads (egg & potato). No kids..no husband? I am jealous!!! You will do fine for your tattoo! The salad looks delicious! Congrats on your tattoo and RELAX on your little getaway! i love tarragon so much that it’s a little ridiculous. I also think it is way too under-utilized. This looks absolutely fabulous. I will definitely give this a try. Hope you had a wonderful relaxing weekend! Another winner, Dana! Enjoy the warm weather. I just thought about using your Creamy Tarragon Vinaigrette on a grilled cheese sandwich. I have no idea how good that would be. Ha.